The benefits of altruism and empathy are obvious. These qualities are so highly regarded and embedded in both secular and religious societies that it seems almost heretical to suggest they can cause harm. Like most good things, however, altruism can be distorted or taken to an unhealthy extreme. Pathological Altruism presents a number of new, thought-provoking theses that explore a range of hurtful effects of altruism and empathy. Pathologies of empathy, for example, may trigger depression as well as the burnout seen in healthcare professionals. The selflessness of patients with eating abnormalities forms an important aspect of those disorders. Hyperempathy – an excess of concern for what others think and how they feel – helps explain popular but poorly defined concepts such as codependency. In fact, pathological altruism, in the form of an unhealthy focus on others to the detriment of one’s own needs, may underpin some personality disorders. Pathologies of altruism and empathy not only underlie health issues, but also a disparate slew of humankind’s most troubled features, including genocide, suicide bombing, self-righteous political partisanship, and ineffective philanthropic and social programs that ultimately worsen the situations they are meant to aid. 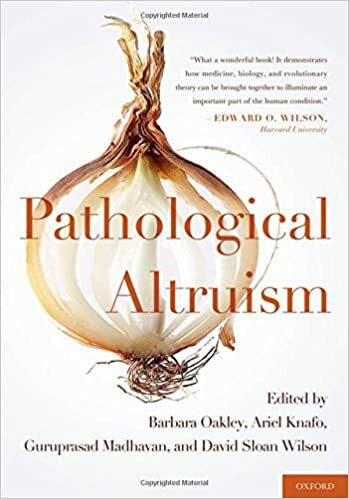 Pathological Altruism is a groundbreaking new book – the first to explore the negative aspects of altruism and empathy, seemingly uniformly positive traits. The contributing authors provide a scientific, social, and cultural foundation for the subject of pathological altruism, creating a new field of inquiry. Each author’s approach points to one disturbing truth: what we value so much, the altruistic “good” side of human nature, can also have a dark side that we ignore at our peril. There’s a lengthy review by Jared Taylor, American Renaissance, July 6, 2012 available here. Plus there’s a pretty thorough article here.